Hiding behind a beautifully-decorated Great Winter Hunt tree, these sharks have been upgraded with KarmaSense™, a new goodness-sensing technology which basically can read if the mouse approaching the tree has been Naughty or Nice. If the mouse was nice, the sharks will use non-lethal lasers that will temporarily freeze the mouse long enough to be safely relocated. If they were naughty, however, the sharks activate their standard seek and destroy mode! School of Secret Santa Sharks Trap Skin can be used on the School of Sharks weapon. The trap's stats (power, power bonus, attraction bonus, etc.) are not changed. The School of Secret Santa Sharks Trap Skin may be made available during the annual Great Winter Hunt event and can be traded on the Marketplace or through Give To Friends. 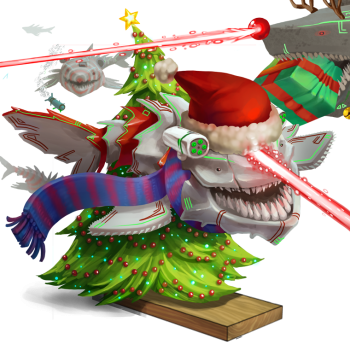 15 December 2015: The School of Secret Santa Sharks Trap Skin was made available from the Extreme Toboggan Challenge Trapsmith with the start of Great Winter Hunt 2015. It cost 10 Advent Chocolates and could not be refunded. This page was last edited on 9 December 2017, at 14:49.